Definitely. You have a shared courtyard outside your door. There’s a rooftop patio, too. Your studio is charming and zen. It’s a prime base to explore. You have everything you need in this studio. It’s furnished, equipped, and cool. It gives you no excuses to procrastinate – write your heart out. We think this is a fab spot for travel writers. Your apartment is city central. Draw a map and spoke out. You’ll know every neighborhood in no time. It's a quiet space to write. The courtyard is like a communal living room. You're in the heart of old Barcelona. There’s not a lot of natural light. This is a studio apartment on Carrer de Guàrdia in Barcelona. The main living area doesn't have any natural light, but you do have a nice shared courtyard. 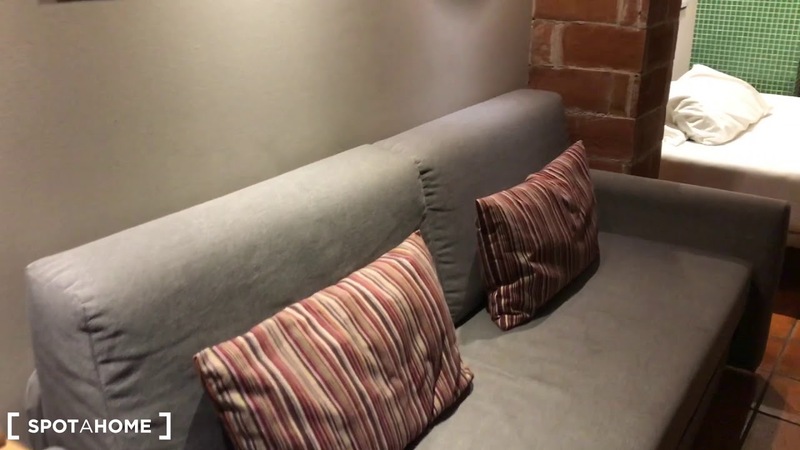 It’s ideal for a single individual who likes to explore the best that the city has to offer and then retreat to a quiet den, away from the world. Sleep in as late as you want. Writing about your exploits – no one will bother you. Meeting new characters – that's what the communal courtyard is for. Unearthing the secrets of Barcelona's nightlife – it's all around you. There are no windows in the main living space.